What is that?! Is what you're probably thinking. I was thinking the same thing when I first stumbled across this approach while doing some research on feeding solids to babies. I've always assumed I would make my own purees for my child. Since that's what you're supposed to do, right? Well, maybe not making your own but the puree texture is the gist of introducing solid foods to little ones now a days. 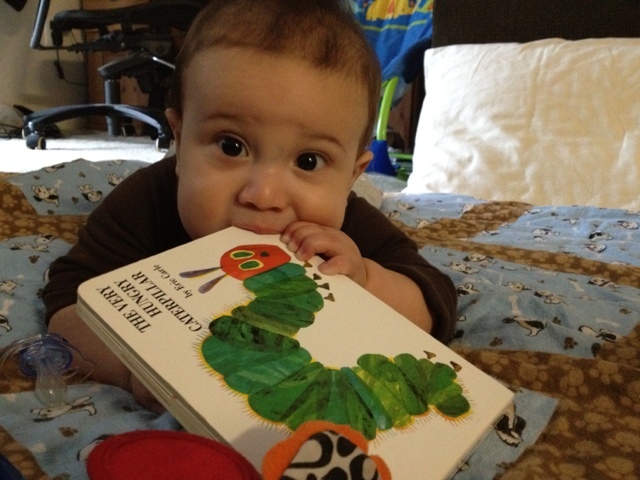 When I heard about baby-led weaning (BLW), I started talking to some mom's that have had great success with this approach as well as read one of the books that is out right now. The method is all about keeping with the natural tendencies of your child. At about 6 months, babies can usually sit up by themselves as well as start putting anything and everything they can grab in their mouth. 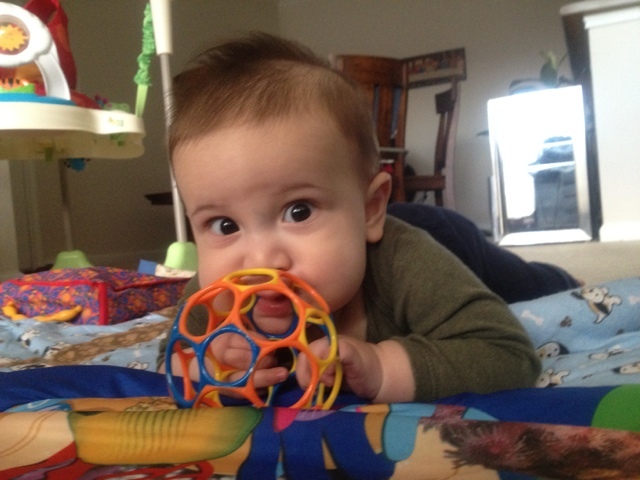 As you can see above and below, our Seph is demonstrating these awesome abilities - toy in mouth, sitting up unassisted, etc. Yup, one more pic below for good measure. The boy puts everything in his mouth. Apparently, this is how the little ones explore. Oh, how I'd love to understand what kind of thinking goes on during baby explorations! But, the point is, if food is in front of him, it will go in his mouth. Also, at about 6 months, babies start to try and imitate those around them. 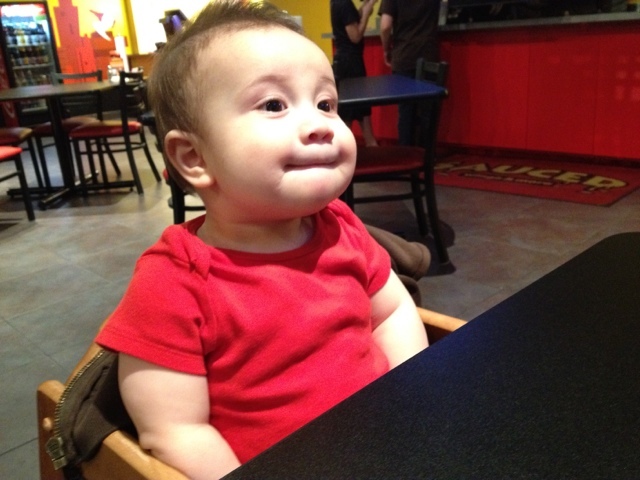 So, around this time, our sweet Bigfoot started showing interest in foods while at the dinner table. He began trying to grab at them and eyeing them. I took this as his way of communicating to us that he was ready and interested in food. As goes the name, the baby is the one leading. The backbone idea of BLW, is that the baby should begin to wean himself from nursing around six months via supplementing the nursing feedings with solid foods. 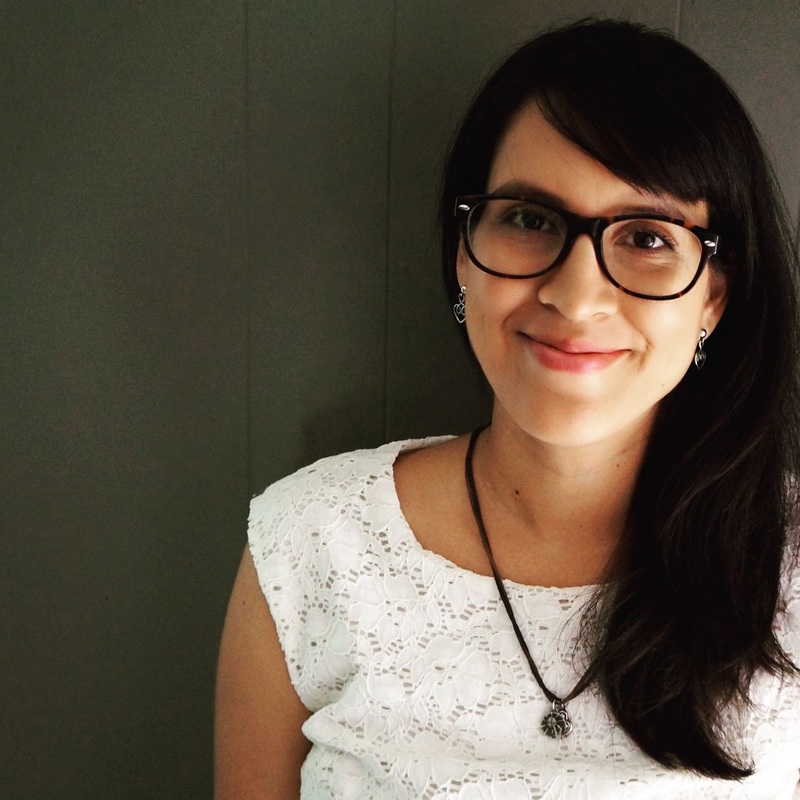 I'll also mention that, in general, breast milk should be the sole source of nourishment for the first six months as recommended by US Department of Health and Human Services, World Health Organization, American Academy of Pediatrics, American Dietetic Association, and more.This is assuming the nursing relationship is a success for mama and baby. Thankfully, after much trial and support, we found success. But, BLW can also happen for those using formula. 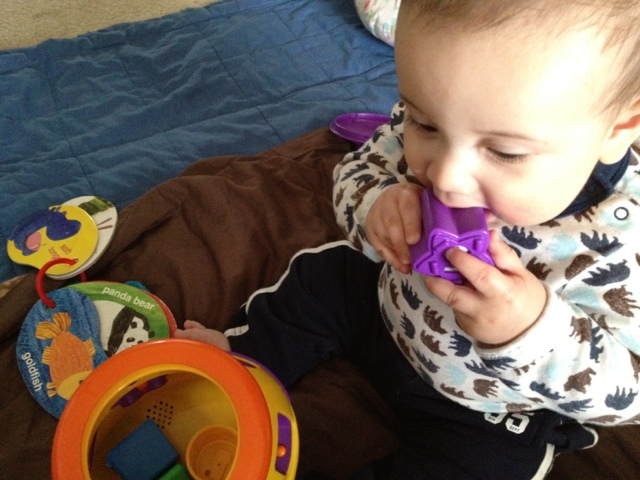 The idea is the more solids he begins to take in, the less nourishment he will need from nursing. Also, the solids that are fed should be your everyday foods - age appropriate of course. So, for me, I figured since he had been in control of his food intake for the first six months of life, why change things up? After gathering all the needed information, we decided to give it a try to see how he led. And lead he did! We started off with avocado. One of my most favorite foods. Avocados are healthy and soft enough for him to gum. 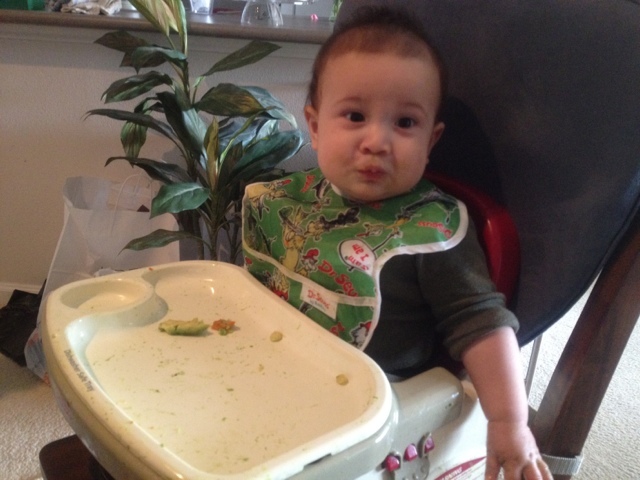 After seeing his first experience with self-feeding with the avocado, I was sold on the approach. Seph had so much fun! He was feeling, tasting, practicing chewing, practicing moving food around in his mouth, exercising his tongue and jaw muscles through the moving of food around his mouth, and swallowing bits and pieces here and there. All in all, you could tell he was having such a fantastic time squelling, laughing, smiling, and looking at us with a face that asked, "Are you all really letting me play with this stuff - so fun and tasty!". I even think there was a "Thank you." in there somewhere. The earlier days of BLW, were exciting. Seph was always ready to try something new. He never knew what he was going to get, which was fun and then when he got something familiar he seemed pleased and just as excited because he knew what to do. Meanwhile, Daddy and I were able to sit and eat our meal with him. It wasn't Troy or I feeding Seph - the little man had that part under control. We would all sit together and enjoy our meals! I wasn't feeding him and then eating at some random time after. Eating together is something that Troy and I value very much and hope to carry with us throughout our lives. So, needless to say, BLW fit right in with our family lifestyle. 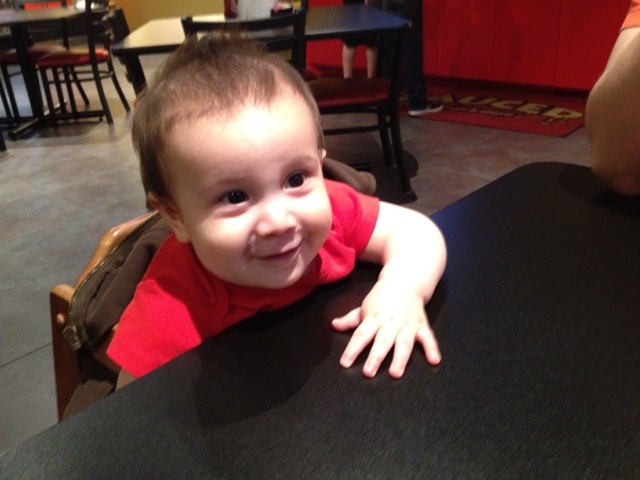 Another great aspect of BLW, is that Seph is so good at restaurants (or, at least, he has been thus far!). I usually bring him some of the foods he's been eating and let him do his thing. Sometimes, if there's something on my plate that would be fitting for him to try, I let him have a go. See that little face of anticipation while we all wait for our food?! So sweet! We have also introduced a spoon at this point. Normally, what I've done here is put a little applesauce or something and hand it over to him. 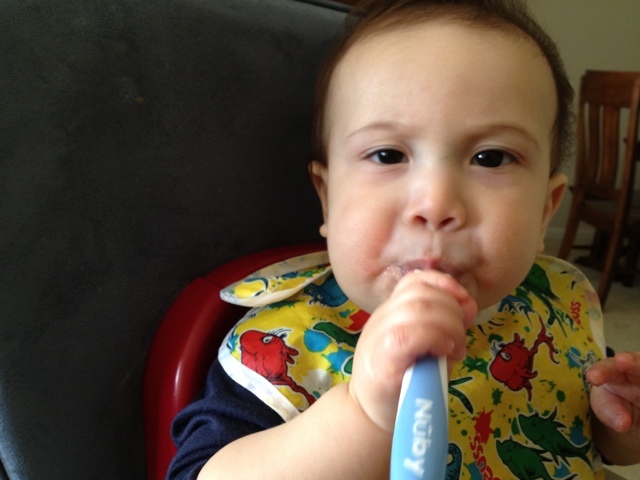 He likes to put the spoon in his mouth (and yes, sometimes flail the spoon after that). But that's OK. He's learning. Sometimes, he just wants the applesauce so bad he'll open his mouth very wide for me to put it in, but I normally try to get him back to taking the spoon from me so he can get some more practice in and understand how the spoon works. At this point, there haven't been too many foods he's tried that require a spoon. I am hoping to have him try some hummus pretty soon. I think he'd enjoy that. But, for now, applesauce is where we practice using a spoon. 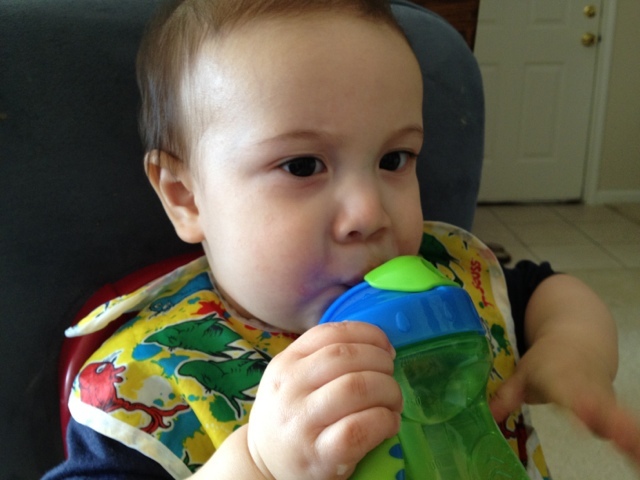 Once starting solids at 6 months, we introduced a sippy cup. Let me tell you, this boy was absolutely thrilled to drink from a sippy cup. The one below is the kind with the straw and he's got that one down pat. He has been drinking water alone, aside from nursing. What I've read, thus far, it's beneficial to hold off on sugary drinks, which I'm all for. Seph loves water so much anyhow, so haven't found any reason to change that up on him. For now, I'd rather him focus more on enjoying different foods and getting whatever sweetness from actual fruits. Below Seph is having some peas. 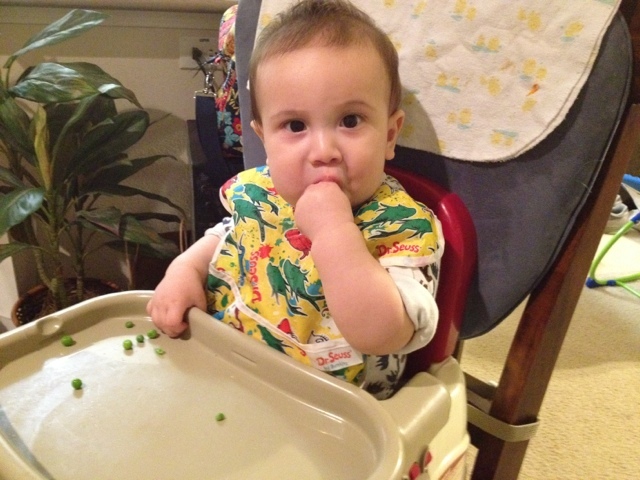 He sure loves his peas! Haha. He sometimes sticks so much of his hand in his mouth just to make sure he got everything off the hand and in his mouth, which is quite impressive. One side benefit to BLW is his advanced dexterity. Our sweet boy developed a pretty stellar pincer grip pretty quick from all the practice and determination of feeding himself. Watching that develop over the past few months has been pretty amazing. And another picture of him enjoying some of his green beans. For us, BLW has been a great experience. I know it's not for everyone. I wasn't sure if it would even be for us or if you could call me a 100% BLWer. When we first started solids, I told myself that if it didn't seem to be going well I would resort back to the tried and true method of spoon feeding him purees. But, as life would have it, BLW went wonderfully. Our son loves mealtime and really enjoys food. He's always up to try something new and seems to enjoy experiencing the different textures and tastes. And not only does he enjoy trying new things, I think him feeding himself gives him a sense of accomplishment, confidence, and independence. The downsides we have encountered would include: minor gagging, people thinking we're crazy, and one allergic reaction. 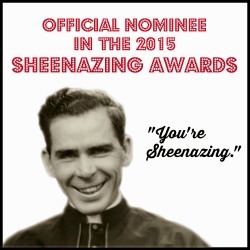 There have been a few minor gags here and there (to be expected), but nothing terrible. 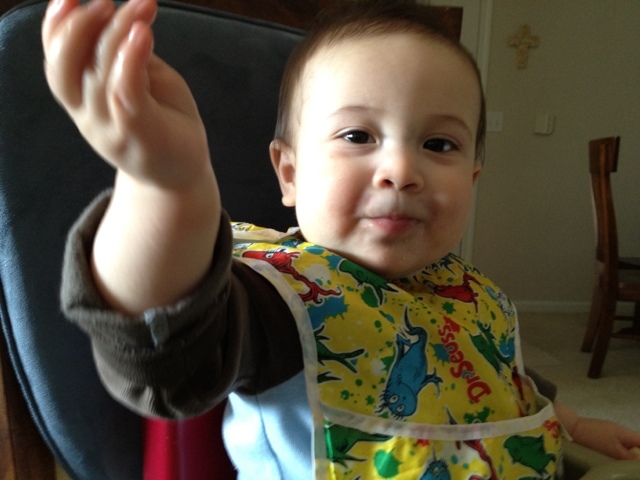 Since we waited to start solids at 6 months his gag-reflex had matured enough that he was able to manage soft baked items or things he could gum. Thankfully, there have been no occasions with choking (which can happen with any method used). 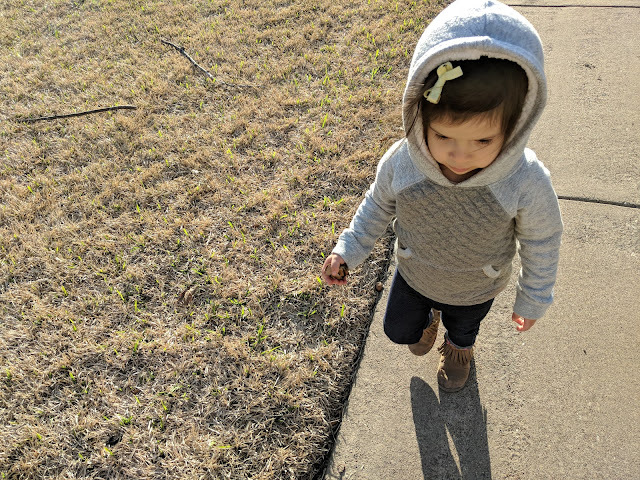 We have had one non-severe allergic reaction to plain whole-milk yogurt, which is why the yogurt, cheeses, and things with dairy have been put off for a little bit (might try again at 9 months, but will be checking with our pediatrician on that one). So, really the downsides haven't been much at all. Overall, our Seph has learned to eat on his own and we couldn't be more proud of him! Foods he has had to date include: avocado, sprouted grain toast, cinnamon raisin toast, bananas, peas, green beans, acorn squash, zucchini, yellow squash, carrots, egg yolk, apples, apple sauce, kiwi, cantelope, plain baked chicken, chicken seasoned with basil and some spicy brown mustard, black beans, pinto beans, broccoli, cauliflour, brown rice, baked sweet potato plain and with garlic, grain bread, jalapeno bread, corn, cucumbers, celery, plain crackers, lima beans, spinach and kale puffs, banana puffs, apple puffs, veggie rice crackers, quinoa pasta, rice noodles, and potatoes.